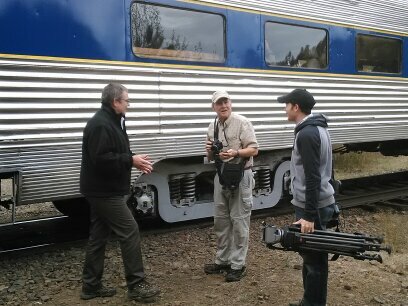 Grant McOmie (left) visits with local photographer Eric Valentine and Grant’s Getaways videographer Jeff Kastner. 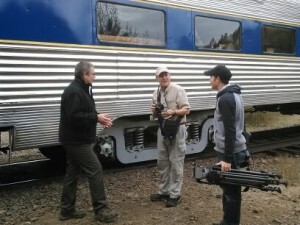 The Eagle Cap Excursion Train was recently featured on Grant’s Getaways, a television show hosted by Grant McOmie and produced for Travel Oregon and KGW TV. We were very pleased to welcome Portland television host Grant McOmie on the train Saturday, September 27, to tape a segment for his television show, Grant’s Getaways. Grant’s wife, Chris, videographer Jeff Kastner and his wife, Jean, accompanied him on the trip. He interviewed passengers and members of the crew and shot lots of footage of the scenery and wildlife, which included bears and bald eagles this trip. Grant’s Getaways is produced through a partnership of KGW Television in Portland and Travel Oregon, our state tourism marketing agency. The program is aired every Saturday evening on KGW News Channel 8 and they can be seen any time on TravelOregon.com, including back episodes. Grant has been traveling around Oregon, hosting programs about the wonderful outdoor recreation adventures and other travel experiences in our beautiful state for 26 years. His voice and friendly presentation have made him a familiar visitor in our living rooms as we travel along, exploring Oregon. Learn more about his book, 101 Oregon Adventures. Thank you, Mr. McOmie, Travel Oregon and KGW! We look forward to your future visits to northeast Oregon. Enjoy the video! Then give us a call to book your 2015 train ride! This entry was posted in Events, Uncategorized and tagged #thewallowas, #traveloregon, Eagle Cap Excursion Train, Grande Ronde River, Grant's Getaways, KGW, scenic railway, scenic train. Bookmark the permalink.